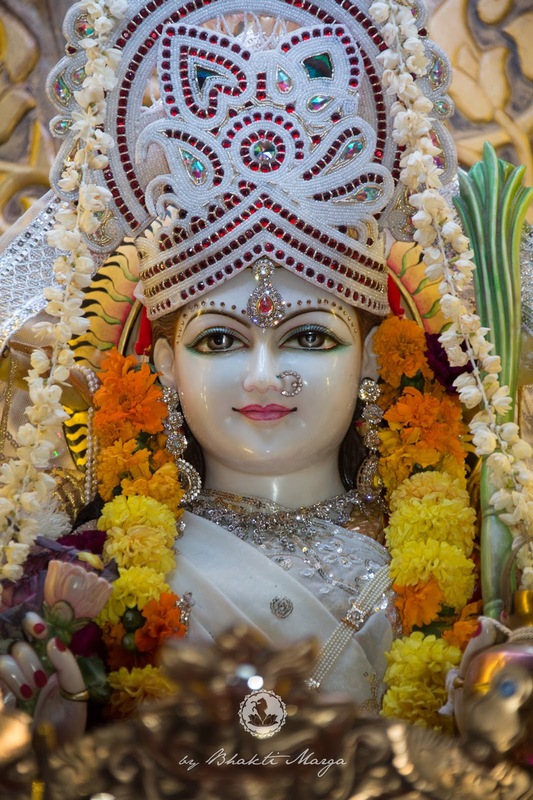 Brahmacharini Devi is the Goddess that represents the importance of sadhana. 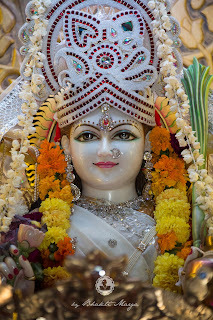 In this form of Durga, She performed an intense penance to obtain Lord Shiva as Her husband. Her right hand holds a japa mala to remind us of our spiritual practices and to chant the Divine Names. 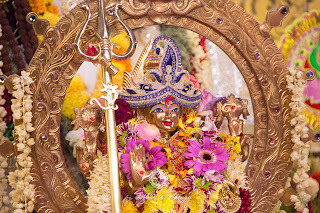 Her left hand holds a kamandalu (water pot), which symbolises Her life-giving Shakti. Brahmacharini Devi's penance that lasted 600 years. She spent the first 300 years surviving only on the leaves that fell from the forest trees. For the next 300 years, She didn’t even take food or water. 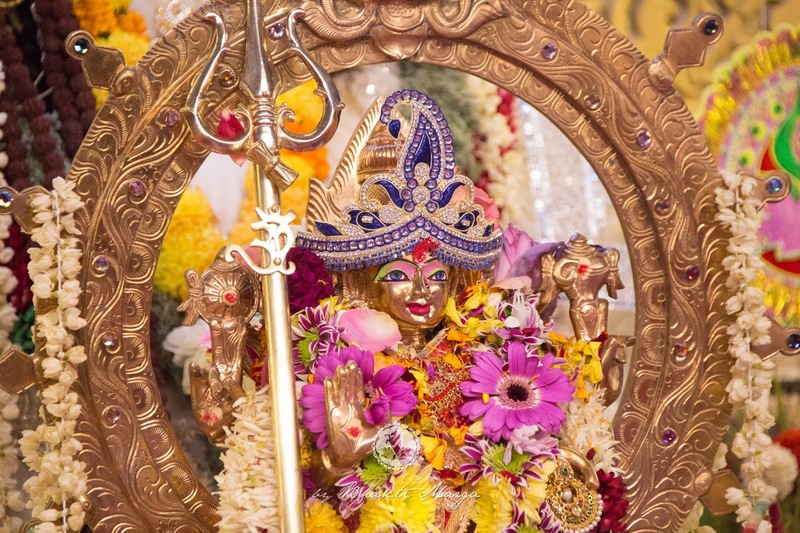 Despite the efforts of Her family, and even Lord Shiva in disguise who tried to disrupt Her penance, She persevered and attained what She so longed for – Shiva Bhagavan. 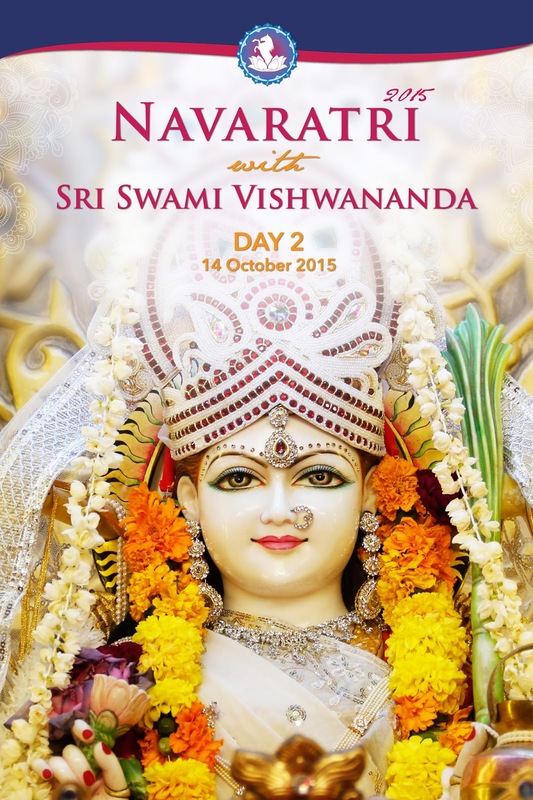 The second night of Navaratri began with the initiation of eight Swami’s and two Swamini’s. Everyone watched as one by one, each Swami and Swamini received their final blessings before officially ending the inauguration into Swamihood. In front, each Swami/Swamini also received a danda (staff), a tulsi necklace, and garland of fresh flowers from Sri Swami Vishwananda. 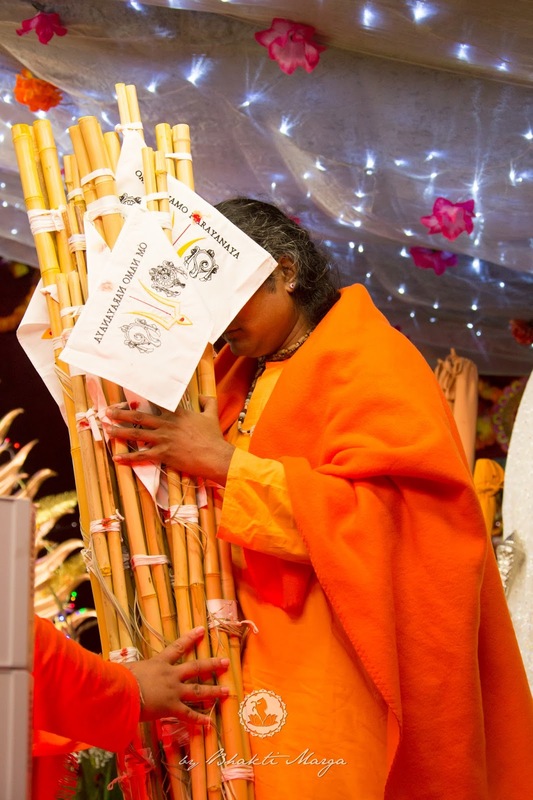 To be a Swami is not something easy. 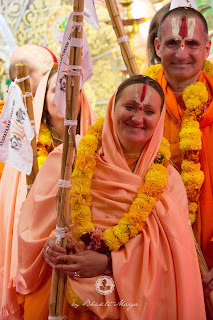 Whether you are a Swami, a brahmachari or a devotee, on the bhakti path one must be humble. To attain the Grace of the Divine, in any situation, one must be humble. This is very important. For Love to awake, it's not just to say, “Oh, I am a brahmacharini” or “I am a Swami”, or “I am this” or “I am that”. As a human being you should love and respect everybody, and above all, as a Swami, you should set a better example than anybody else. 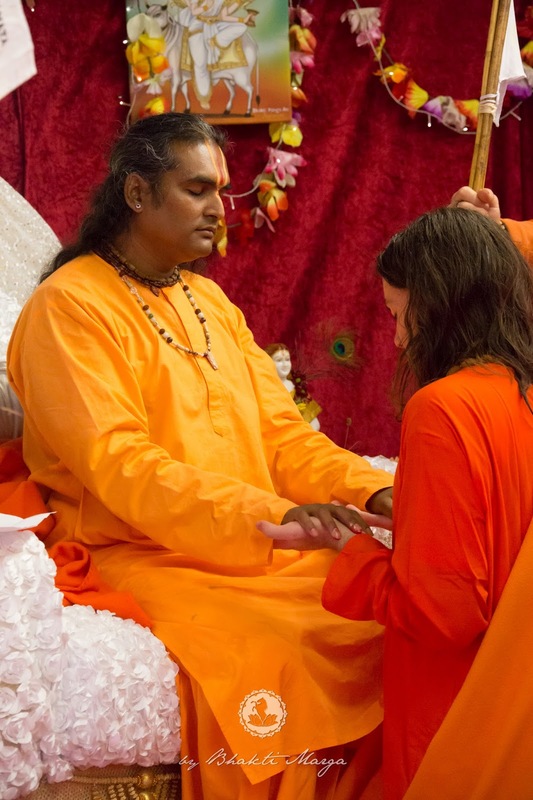 That's why Mahavatar Babaji has chosen you, because He saw certain qualities inside of you. Now, you are not aware of these qualities, but that will come. 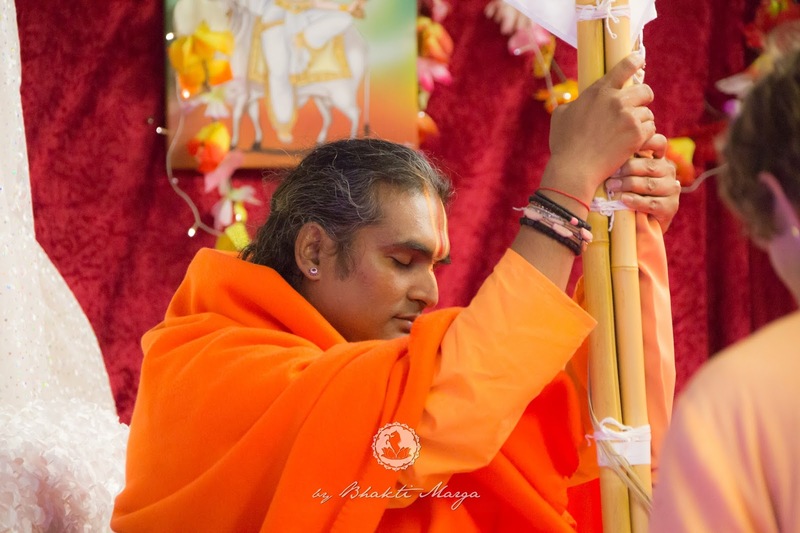 This is your dharma! When you take a certain path in life, that path becomes your dharma. Dharma is not about going around saying, “My dharma is only to become a healer” or to become this and that. Each one has his or her own dharma. A dharma of a Grihastha is to look after the family. What is the use of a Grihastha, if he or she is doing other things instead of looking after his or her family? If you have taken a path in life, you have to honour that path. The path of a brahmachari is to concentrate on God. It doesn't mean that anyone is superior. Don't think that when one becomes a Swami, a brahmachari, or a devotee, they are superior. No, there is no superior. In God's eyes everybody is equal. How much you shine your light, that much light He will shine back to you. However, His Love, His blessing is equal. Even though the initiations were undeniably the highlight of the night, it’s astonishing to remember that all of this took place before the worship of Brahmacharini Devi began. 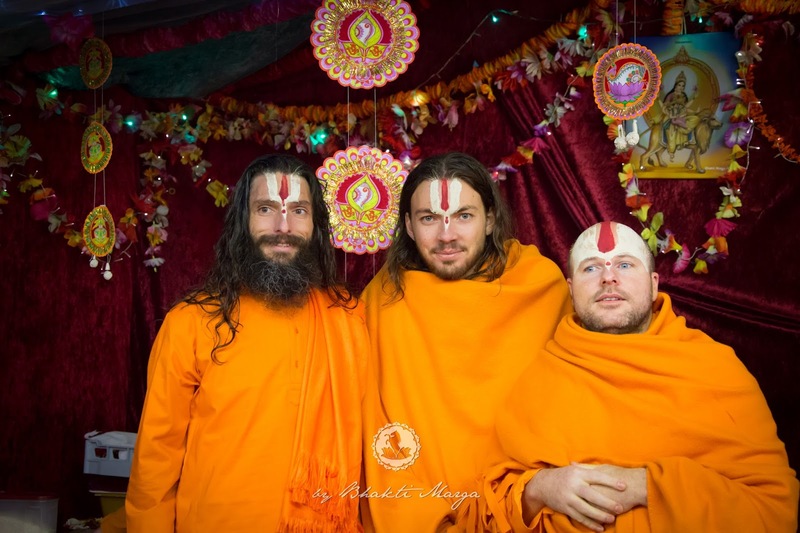 The rest of the night included a yagna, bhajans, Devi Mahatmya narration, and much more. And still, after of all the glorifications and final prayers were finished, the excitement had yet to reach its climax and the Dandiya (stick) dancing broke out. The night was, yet again, amazing in every way possible. The second night of Navaratri is one that will be remembered for a very long time, as each initiated Swami and Swamini is assigned to uphold a specific dharma. 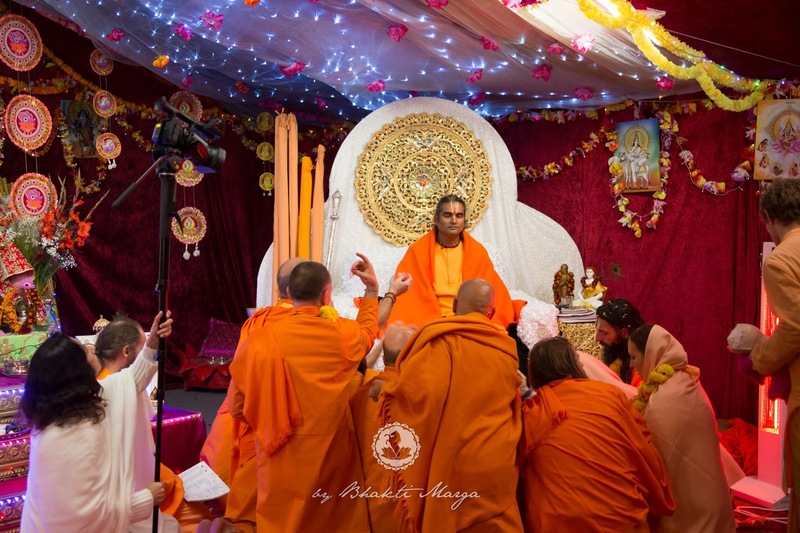 In time, each will grow into their respective positions and work hard to spread the message of Sri Swami Vishwananda. 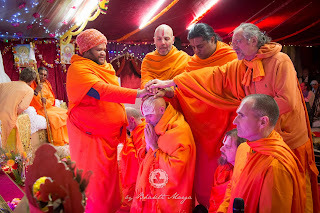 Last night was not only the beginning of Swamihood for these ten devotees, but it was also a historic night for the future of Sri Swami Vishwananda’s mission. Just as God never gives a blessing for the sake of one person, so too is the case with Sri Swami Vishwananda. The blessing that Swamiji gave last night to each Swami and Swamini is one that will not be kept for themselves, but is a blessing that will be shared with the whole world; it is a blessing that will empower the Swami’s and Swamini’s to carry on the life purpose of Sri Swami Vishwananda: to open the hearts of man.